In our experience, while 80% to 90% of defendants in federal criminal cases cooperate, very few get credit for it. The U.S. Sentencing Commission recently published data that confirm our experience. The latest quaterly report from the U.S. Sentencing Commission has preliminary data on sentences given by federal courts from October 2013 through March 2014. These data tell us that, during that time period, the primary offense was drug-related in 11,931 cases, which made up 32% of all federal cases. That was the biggest group of cases in this report (only immigration-related charges came close to that many cases with 29.4% of the total). The U.S. Sentencing Commission is very interested in whether sentences given out were within the guidelines that it has given, and if not, why not. One of the common reasons courts give out sentences that are less than the guideline range is because a defendant cooperates with (i.e., gives substantial assistance to) the Government; this is called a section 5K1.1 reduction (named after the section number of the applicable rule). This report tells us that of those 11,931 cases, in about 24% of them the defendant got a sentence below the guidelines for substantial assistance. The striking thing about this number is not how high it is but how low it is. Naturally, it does not include cases where the defendant was sentenced and later received a sentence reduction under Rule 35(b) of the Federal Rules of Criminal Procedure (which is the post-sentencing equivalent of 5K1.1). 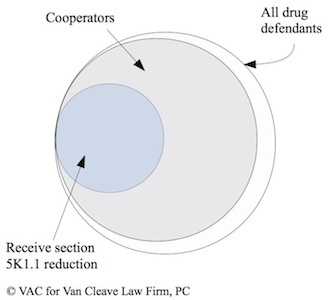 But it is our experience in our practice that 80-90% of defendants in drug cases cooperate with the Government. This 24% only represents cases in which the Government filed a motion to give credit for cooperation at the time of sentencing. During this time period, there was just one case of simple drug possession (out of about 1,100 such cases) in which someone got a section 5K1.1 motion. In our experience, when Government agents do not feel pressured to give a defendant a break for cooperating, they will simply take the defendant’s information, run with it, and find any excuse to leave the defendant without the reduction for substantial assistance. What this report confirms is that if a defendant has kept their end of the bargain by cooperating under a promise of a sentence reduction, but the Government has not kept their end of the bargain by failing to give the promised sentence reduction, the help of an attorney experienced in Rule 35 matters is needed. It also shows that if someone intends to offer cooperation after having been sentenced, they should likewise have an experienced attorney looking out for their interests to keep the Government from trying to get something for nothing. If you’d like more information on this, generally, please see our article on Sentence Reductions (click here for the condensed version). Call us today at (512) 693-9LAW or email us if you’d like to discuss a situation of this nature. Just click on the “Contact Us” link here or at the top of the page, and we would be glad to talk to you about your matter.